Courageous Azerbaijani cyclist Ramil Ziyadov continues his glorious journey around the world. After a year of cycling, the courageous Azerbaijani cyclist Ramil Ziyadov has reached Rome, Italy. 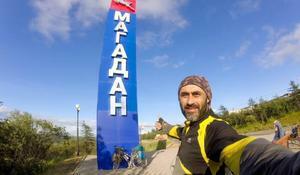 Courageous Azerbaijani cyclist Ramil Ziyadov has reached Ukrainian capital, Kiev. Azerbaijani Ramil Ziyadov is still pedaling despite rough wind and 14 degrees below zero of Russia. Azerbaijani cyclist Ramil Ziyadov started a two-year trip, under the motto "In the name of Azerbaijan", in which he plans to cover 45,000 kilometers across Eurasia and Africa. The first Azerbaijani cycle traveler, Ramil Ziyadov, started a cycling tour through his home country from Barda on October 17. First Azerbaijani cycle traveler Ramil Ziyadov, who has covered over 15,000 kilometers in six months, plans to continue his journey.